This CD contains every piece that Beethoven wrote for solo piano. 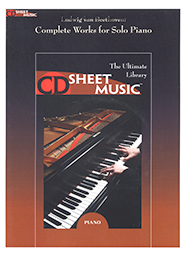 Included are all 32 sonatas, all 7 concertos, every Bagatelle, and every other piece - over 1500 pages of music. Ludwig van Beethoven was born in Bonn, Germany, in 1770 and died in Vienna, Austria, in 1827.